Wash the cauliflower well, cut into small florets. Take one liter water in a bowl, put two tea spoons salt in on it and soak the cauliflower florets in it for an hour. ( to clean thoroughly the cauliflower) Keep aside. Take the oil or butter in a wok/ Kadahi, heat on full flame. Add cumin, when it starts spluttering reduce the heat to low flame and add cauliflower florets and salt to it, mix well. Cooke covered with a lid on a low flame till well cooked. Sprinkle the pepper powder on it. Serve hot with all Indian breads. Cauliflower is a very good source of vitamin C and manganese, which are both powerful antioxidants. It contains glucosinolates and thiocyanates (including sulforaphane and isothiocyanate), which help to increase the liver’s ability to neutralize potentially toxic substances that could lead to cancer if left unattended.cauliflower-containing diets are good for cancer prevention. regular cauliflower consumption can help decrease the risk of inflammation-mediated diseases such as arthritis, obesity, diabetes mellitus. glucoraphin present in cauliflower appears to have a protective effect on your stomach lining. With glucoraphin, your stomach is not prone to the bacterium helicobacter pylori, thereby reducing your risk for stomach ulcer and cancer. cauliflower consumption is protective against cardiovascular and cerebrovascular diseases. Cauliflower is rich in folate and also vitamins like vitamin A and vitamin B, it helps in growth of cells. Cauliflower also contains calcium which has numerous benefits. Calcium helps to make our bones and teeth strong along with many other important functions like transmission of nerve impulses. Cauliflower also helps us to lose weight. Cauliflower is also a good source of vitamin C, which is a key element to burn fat. And it also contains folates which again help in weight loss. To boost vitamin K content in your system, increase the cauliflower content in your daily diet. Vitamin k plays a key role in development of bones as it helps in development of bone cells. 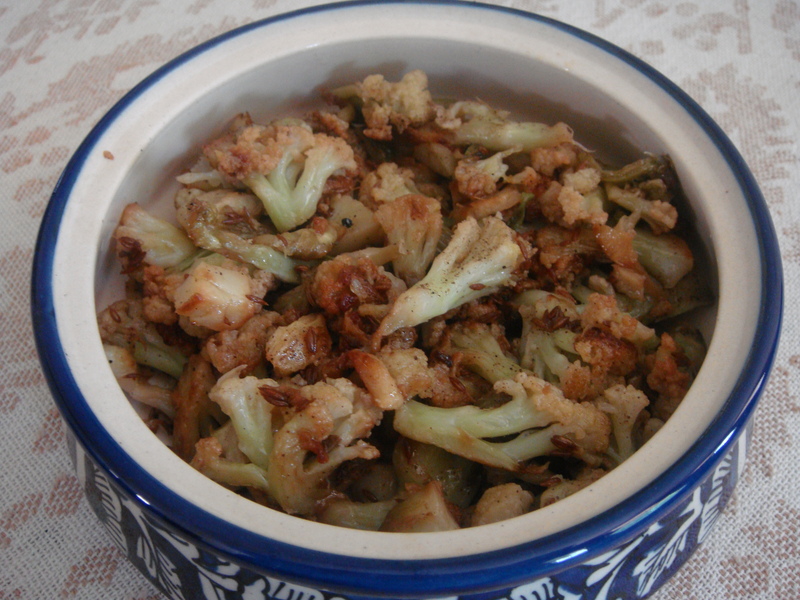 Thanx, for such a quick ,simple and delicious recipe of cauliflower.